Parents, beware. A new study shows that watching just nine minutes of SpongeBob SquarePants can mess with children's brains. The AP reports on the study of sixty four-year-olds, who were assigned either to watch SpongeBob, to take in the "slower-paced" show Caillou, or to draw. After nine minutes, the kids took a variety of cognitive tests, as well as a test of self-control that involved measuring how long they could wait to eat snacks. The SpongeBob kids scored an average of 12 points lower on the cognitive tests than the other groups, who did about the same as one another. And they were only able to wait about two and a half minutes before scarfing the snacks, while other kids could hold off for four. Study author Angeline Lillard said, "I wouldn't advise watching such shows on the way to school or any time they're expected to pay attention and learn." 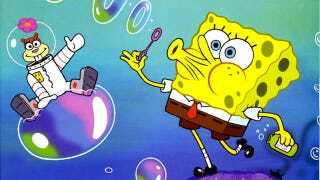 Nickelodeon predictably criticized the study, arguing that SpongeBob is aimed at 6-11-year-olds, not four-year-olds. But kids aren't known for their adherence to such recommendations, And for a harried parent in need of a quick break, the difference between 4 and 6 may not seem like much. Unfortunately, there seems to be a big difference between the antics of SpongeBob and his pals and the slower speed of Caillou, which is aimed at the four-year-old set. And Lillard says the problem isn't unique to SpongeBob — she's seen similar results with other fast-paced cartoons. It's not clear whether the denizens of Bikini Bottom have the same effect on their actual target audience. But Lillard chose 4-year-olds because they're at "the heart of the period during which you see the most development" in self-control. And even a small amount of a non-age-appropriate cartoon seems to have affected this ability. Do the kids bounce back afterward, or does repeated viewing of SpongeBob and the like cause them to become permanently impaired? We don't know yet, but it's disturbing to learn that kids may be at risk from a program that seems pretty innocent. Watchdog groups tend to focus on the content of children's programming — but if Lillard's right, the pace may matter more.